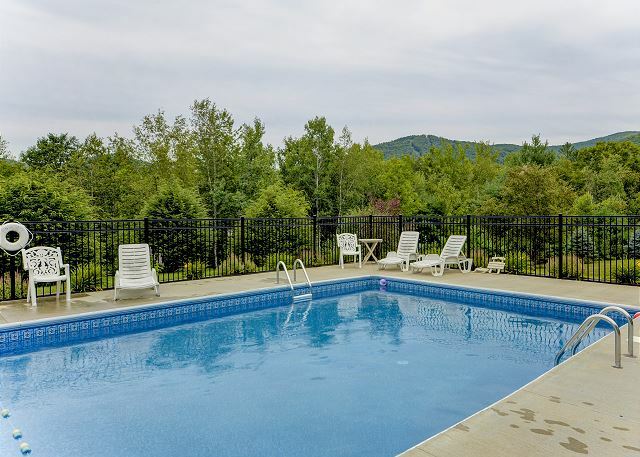 Immaculate 4BR Condo w/ Cranmore Views! 2 Living Rooms,Cable, WiFi, Games! Bear Puddin', Your Mountain Escape! Bear Puddin’ is a spacious 4 level, 4 bedroom townhouse that is perfect for a large family or multiple families vacationing together. The main level features a large updated and fully stocked kitchen with a TV, attached sunroom with breakfast table, and window to the dining area. A large dining room table that can extend to 108” is the center of an open dining area that includes a Bluetooth stereo. Bear Puddin’ also has a complete set of fine china (service set of 12), punch bowl, and wine glasses to make your special occasion even more enjoyable. The dining area opens to the first living room with a large HD flat screen TV, DVD player, and a deck overlooking the spacious yard and Cranmore Mountain. Upstairs is a luxurious master suite with a king size bed, beautiful mountain views and a full bathroom that features both a bathtub and walk in shower. The suite also contains a built-in desk for those that require office space while on vacation. Down the hall is another bedroom with two double beds and an attached full bathroom. A few steps down from the dining area is a second living room with a comfortable queen-size pullout sofa, large flat screen TV, a library of books, game table, a closet full of games, mini fridge, microwave and a half-bathroom. There is also a full sized washer and dryer. Down the hall from the second living room, you will find the third bedroom with two double beds and a private bathroom with a walk in shower. The lower-level has the fourth bedroom with a comfortable, full sized sleeper sofa, flat screen HD TV, DVD player, foos ball table and large closet. If you don’t require a fourth bedroom, this area can also be used as a level for kids, teens or a third living room. The property has amazing views, a spacious yard, tennis court and a swimming pool that features a backdrop of the mountains. Keep in touch with family or post pictures of your relaxing vacation with our free WiFi. Catch the game on one of the four flat screen HD TVs in the house. This stunning property contains all brand new furnishings, bedding, and mattresses. The owners have thought of everything to make your vacation at Bear Puddin’ relaxing and memorable. There are extras such as a cake pop maker, fondue set, indoor s’mores maker, kid’s dinnerware, highchairs, Graco Pack and Play, outlet protectors, sleds, tennis rackets, landline phone with unlimited long distance and office supplies. Bear Puddin’ is in a private location with access to hiking, biking and snowmobile trails and is less than 5 minutes to North Conway Village with several great shops, incredible restaurants, Cranmore Mountain and North Conway’s tax free outlet shopping. Book now for summer, just 10 minutes from Storyland! This association has a strict rule prohibiting renters from using the pellet stove and wood stove. Nearby attractions for all seasons include: North Conway Scenic Railway, Santa’s Village (47.7 miles), downhill skiing at one of the many nearby mountains, cross country skiing, snowmobiling, snowshoeing, tubing, ice skating, sleigh rides, horseback riding, hiking, rock climbing, biking, Storyland (7.1 miles), river fishing, swimming, golf, canoeing/kayaking, scenic drives, moose tours, ziplines, gondola rides, sightseeing and the scenic Kancamagus Highway. THIS HOME IS NOT AVAILABLE FOR A SEASONAL OR LONG TERM RENTAL. Eight women stayed in this multi level condo comfortably. It was clean and spacious. We had a problem with directions and our phone call was answered immediately. Our location to downtown was perfect. We would stay here again. Very clean and nicely updated multi-level townhome with plenty of living space for one large or two smaller families. Several levels of living rooms, large dining room table, well stocked kitchen. Fireplace and wood stove pretty, but not accessible to renters. Would recommend this home without hesitation to any group of 8-10 looking to stay in heart of N. Conway with views of Mt. Cranmore from back of home. This condo has everything needed for a great family stay. They had Bear Puddin' coloring sheets (our toddlers loved) and every game you can imagine. The condo was extremely clean and furnished perfectly. The kitchen has everything needed as well but remember to bring your favorite spices. 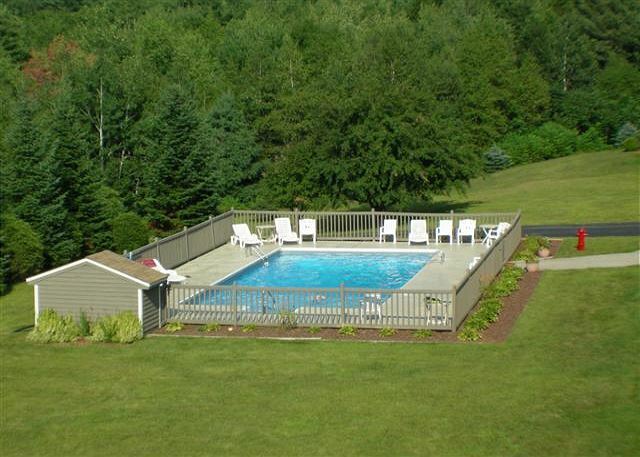 The pool is not heated unfortunately but is situated beautifully on the property surrounded by mountains. I would will go back again. Bear Puddin' rocks! We recently spent the weekend to celebrate my husband's 60th birthday. We were looking for a comfortable unit that would accommodate all of us. This unit was wonderful. Roomy and comfortable. The two separate living room areas were great, and a dining table that accommodated all of us was perfect. We had a new baby with us, so the quiet lower level was perfect. The owners provide just about anything you could possibly need...kitchen ware, movies, books, games! We thoroughly enjoyed just hanging out together as a family and already are hoping to book this unit again! My wife and kids love this place! Plenty of room for everyone. The condo was very nice and located near the heart of the town. The rental team was very helpful and we would definitely rent from them again as well as stay Bear Puddin in the future. This condo is a great place for multiple families to rent together. Plenty of space for everyone and very well maintained. Good for small children as well. We enjoyed staying at Bear Puddin. We found the place to be clean and comfortable. There is plenty of space for families to spread out. The pool was clean and refreshing. Me and my family really liked the house ,it is close to everything.we love it.